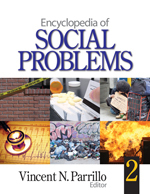 The Encyclopedia of Social Problems (2008) is now available at the Library. Over 600 entries offer an interdisciplinary perspective into many social issues. The two volume set covers all of the major theories, approaches, and contemporary issues in social problems and provides insight into how social conditions get defined as social problems, and the ways different people and organizations view and try to solve them. Here is a link to the Choice Review.